Last week NBC (Nice Big Cats) news declared the benefits of Tea - so why not try some. This Yogi Ginger Tea was challenging, to say the least, and I can't figure out why one must be in a strange Yogi position to enjoy the pleasures of the leaves. Catnip is far easier. Tugged at the 'kitten proof box' to get a better aroma whiff and ... well you be the judge of what I think of Yogi Ginger Tea. Bed Time Tea sounded PURRfect for my abundant cat naps, so I took the box to bed with me- no wrestling with the wrapping or boiling water. So simple even an Italian Kitty can do this! March 26th I'll be 10 months young! Pinch my paws - am I dreaming life is so fantasticat? Corned Beef or a Cannoli? You have to try everything once, and I did on St. Patrick's Day. Looks like a challenging meal for this Italian kitty (have never figured out if I'm left or right pawed) and where's the Corned Beef??? In true Irish fashion, I wrapped up in green, green and more green to go Shamrock hunting, and got Luck O' The Irish - caught myself a little leprachaun! Green tea, green eggs, I even saw green dogs .. catzowey did I indulge my paws in too much catnip! When I returned home to my hunky monkey, I was still starved and pounced my paws to my Italian calorific cupboard to attack a slab of salmon (gratefully not green). My first Daylight Savings time definitely gave this creature of habit confused mews. But I do know it's time for Spring training. Now if I can just get my mini meowster Giants uniform out of this darn bag (4 paws vote for banning the plastic bag - paper is feline safe and ecologicatically more fun to shred). Whoa, this smitten kitten is purring like a robust Tanzania Tiger knowing I might toss out the 1st ball at SF Giants Opening Day - well miracles do happen! Hmmm .... am I hearing hissfits of laughter from you? I tugged and I mugged and I hit and I bit - with all my ivories! 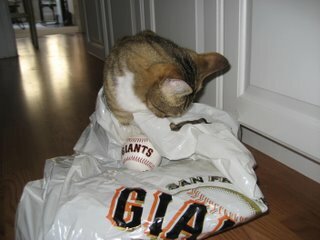 Aw shucks, my ballpark debut won't occur unless I can pick this circular thing up! Maybe I need a whisker trim (you know the pro players shave their heads for a centrifical reason). 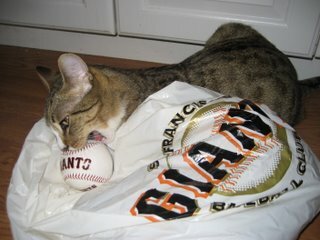 Got any "PURRfect Pitch" ideas for me and my 4 paws? If I strike out with the Giants, I may opt for the Chicago White Socks,Sox? - ah heck, whatever. I've got 4 permanent Socks for the Sox and it may be a natch catch for this kit kat! Everybody's barking about the glitzy paws at the San Francisco SPCA's Bark and Whine Ball last week, a dog gone good event - even for a cat in disguise! In fine Black Tie Bow Wow style, this was the op of a life time for humans whose dogs invited them along. Where else can you go to have white-jacketed Valet attendants open your dog's car door on a racy red carpet for the canine grand entrance! 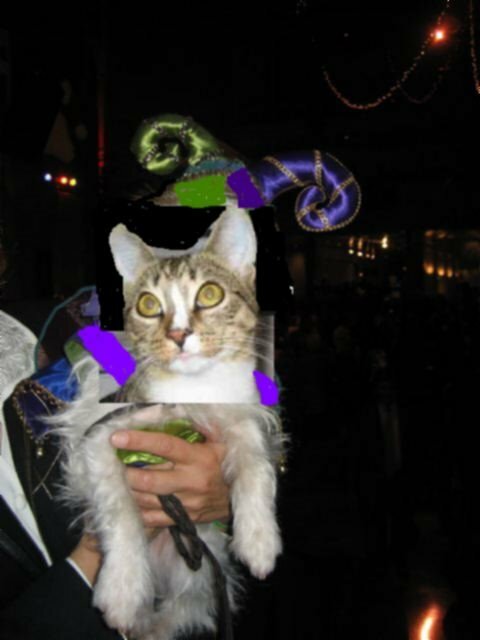 This mighty meowster needed to see this gig with my owns paws, so I packed my kitty couture costumes, called Big Dog Taxi Company and crashed the party - here is my frolicking self disguised as a merry Mardi Gras Terrier King. The short hairy legs are definitely not my Tom Cat style and I can't count how many people picked me up like a pup! Then I got smart - 'big dogs do it better' I heard - so I began to think big - and rapidly changed into my next costume - a St. Bernard to the rescue! 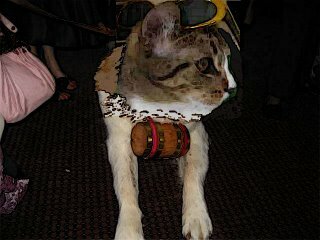 I danced and pranced while humans petted me - nobody even thought about picking me up at this size! Abundacat good eats at this dog ball: Sushi Bar turned my Purr machine on until I found the carving station and declared to the waiter "grrrr, rare please and hold the bun"! Of course I demanded a doggy bag!